Quit smoking and reward yourself with the money saved. Create a shopping list, add photos and prices, and let the app tell you when you can afford your treat from your smoking money. Get health benefits updates daily. Press the big HELP button for inspiration to keep you going. We believe in you! Now, you just have to believe in yourself. 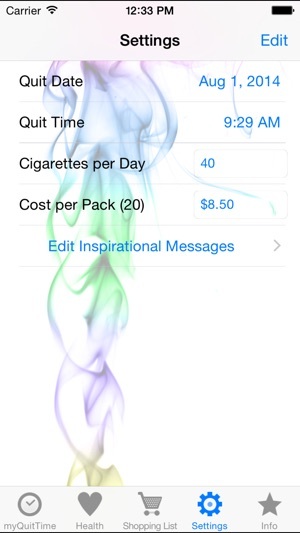 is an iPhone app designed to help keep ex-smokers on the path to success through inspiration and targeted incentives. If you've already stopped smoking, fantastic! Well done. You can use myQuitTime to provide the inspiration and incentive to keep you a successful non-smoker. If you haven't stopped smoking yet, you are about to enter a new world where everything is better, brighter, and much more wonderful. 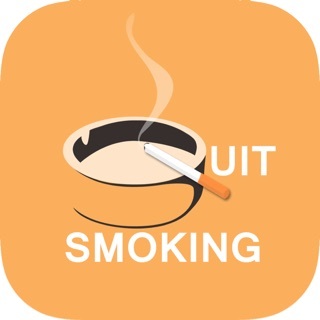 myQuitTime can not only help you stop smoking, but it can make the process easy and enjoyable. - Years, Months, Days, Hours, Minutes, and Seconds since you stopped smoking. - How much money you have saved since you stopped smoking. - How many cigarettes you haven't smoked since you stopped smoking. - How much of your life you have potentially saved since you stopped smoking. 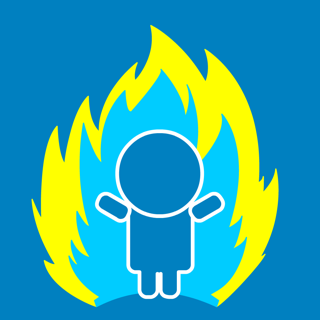 - Your current Health Improvements Status. has a big red Help button for those occasional moments of weakness. 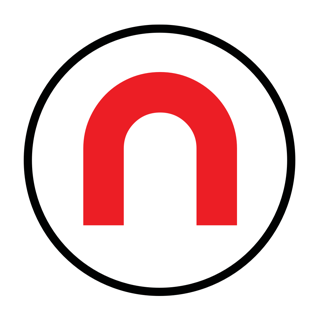 Just click on the big red Help button and the app will display an Inspirational Message to help you through. 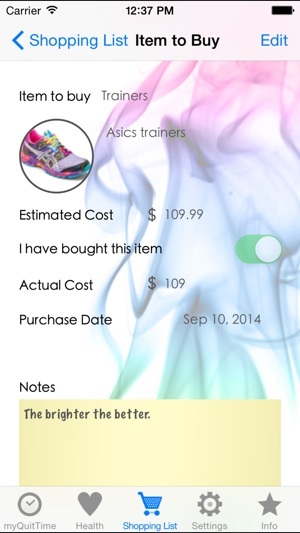 You can even edit the Inspirational Messages, so you can add your own Inspiration and make the app specific to you. 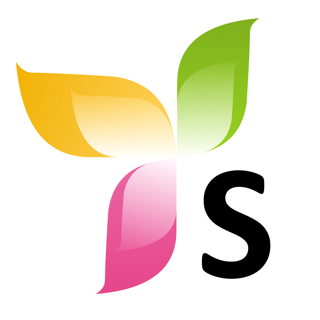 has a shopping list for you to create rewards that you would like to spend your money on instead of wasting it on cigarettes. The app will tell you how long it will take you to save for each item, and treat yourself for a job well done. 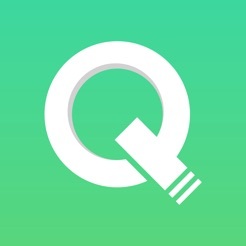 Thanks for using myQuitTime! 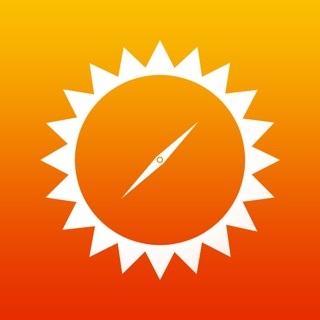 To make our app better for you, we bring updates to the App Store whenever needed. You can update the app automatically (without checking back here) by going to Settings > iTunes & App Store > Automatic Downloads and turning on Updates. 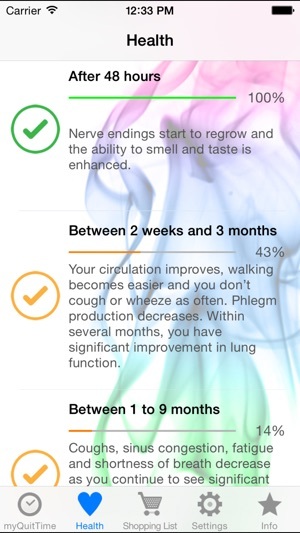 As a smoker for over 20 years, and now a non-smoker for over a year and 2 months; I found this app helpful as positive reinforcement! What a great feeling it is to open the app and read my unique calculations of success up to this point. My sense of accomplishment subsided any urges I may have to return to smoking. 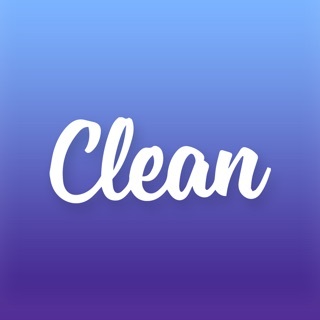 I would highly recommend this app if you like to see some type of "immediate" changes in the beginning stages of quitting, when it may be the most challenging. 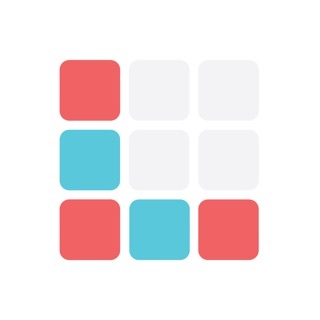 I found this app when I saw a friend using it. It tells how many days you have off cigarettes. It tells how many cigarettes you would have smoked and how much money you saved. 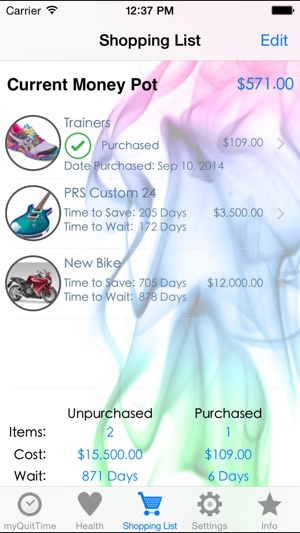 It has a feature where you can add items you will buy with the money you saved and how many days until you will have the cost of the item. You can share your results in social media. 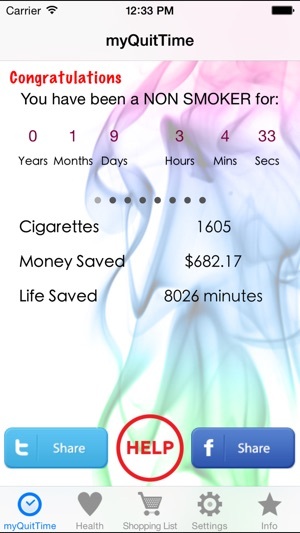 I like this app and will view it regularly to keep going on my track of being smoke free. 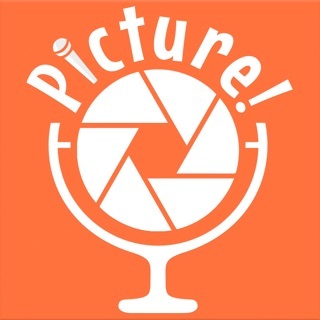 Picture!Picture! SelfieShot The voice command, sound activated, hands free selfie cam camera! 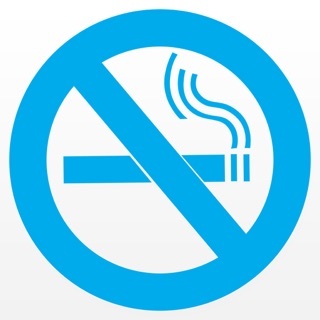 Smokefree - Quit smoking now!